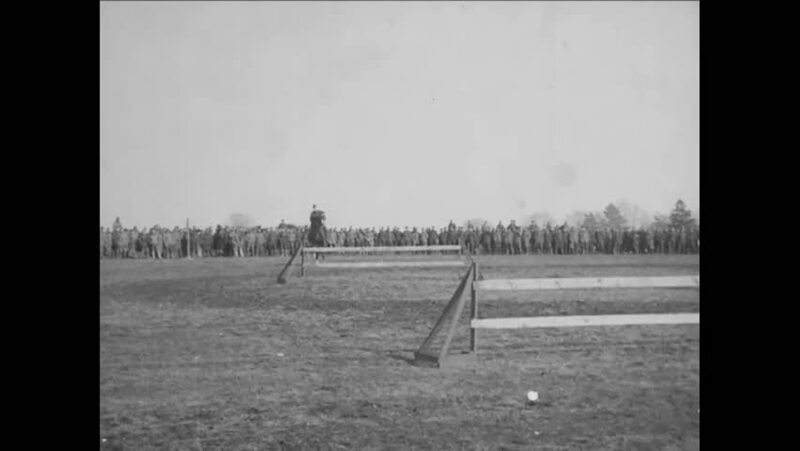 CIRCA 1919 - Horses jump hurdles at the 6th Division horse show. hd00:28CIRCA 1944 _ A train fails to derail after rolling over a multiple gaps in a track during a derailment test. hd00:36CIRCA 1944 - American fighter planes take off from a Soviet air base; Soviet servicemen wave them off. hd01:21CIRCA 1919 - Participating troops march into the stadium for the inter-Allied athletic games in athletic ensembles. hd01:25CIRCA - 1918 - Soldiers of the 27th Division practice setting up Stokes mortars in training for Flanders and Ypres-Lys Operations, in France. hd01:14CIRCA 1920s - Shots of various street signs and markers, a woman allows a car to pass through a gate, and bricklayers work in the Netherlands. hd00:32CIRCA 1943 - Footage shot from the Memphis Belle as it is guided into place on a runway in front of a bond drive crowd.